A wonderful Beasts of the Mesozoic Raptor Series Linheraptor exquisitus. A superb 1:6 scale Linheraptor exquisitus dinosaur model from the Beasts of the Mesozoic series. The Beasts of the Mesozoic Wetlands Accessory Pack featuring Buitreraptor gonzalezorum. A fantastic dinosaur diorama featuring Buitreraptor from the Beasts of the Mesozoic range. The Beasts of the Mesozoic Mountains Accessory Pack featuring a juvenile Troodon. 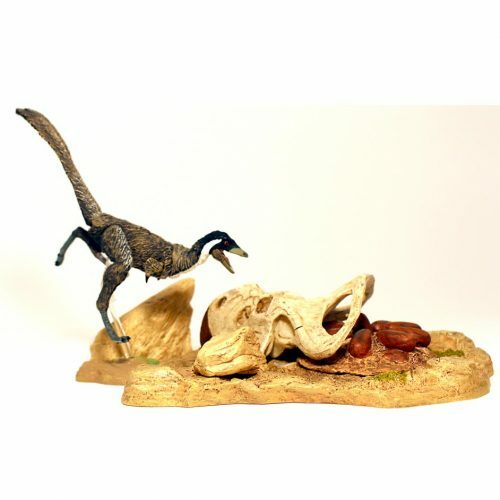 A superbly detailed Beasts of the Mesozoic Mountains diorama with an articulated, juvenile Troodon dinosaur model. The Beasts of the Mesozoic Forest Accessory Pack featuring a Microraptor model. A superb Beasts of the Mesozoic Forest diorama with a model of Microraptor included. The Beasts of the Mesozoic Desert Accessory Pack featuring Mononykus olecranus. A fantastic Beasts of the Mesozoic Desert dinosaur diorama with a Mononykus model. A superb Beasts of the Mesozoic Zhenyuanlong suni figure. A 1:6 scale Zhenyuanlong suni articulated dinosaur model, part of the Beasts of the Mesozoic replica range. An amazing Beasts of the Mesozoic 1:6 scale Saurornitholestes sullivani dinosaur model. A fantastic Beasts of the Mesozoic Saurornitholestes sullivani. An amazing Beasts of the Mesozoic Raptor Series Pyroraptor olympius dinosaur model. A 1:6 scale, articulated Beasts of the Mesozoic Pyroraptor olympius.